Well, for one thing, I have this stupid head cold. T got it first and I kept telling him “Don’t breath on me.” But you know how well men listen. I would wake up in the middle of the night, and there he’d be, ¾ of an inch away from my face, snoring away and breathing that cold right into my airspace. I’ve used 2 sick days this year with that stupid stomach virus (or peanut butter poisoning, whatever it was). I am not using any more sick days. Not for being sick, anyway. So I’m coming to work and sniffling away. And don’t get all indignant with me. I’m not likely to infect anyone. I sit in such an isolated part of the building, you’d think I was contagious every day. So, I don’t know if it’s this cold or the cold medicine or the fact that I desperately need glasses, but I just have not been able to finish that stupid baby sweater. Jeez, I remember when R and M were little, I could knock one of these things out like nothing! No thought process involved. No pain. Now, somehow, I have to knit everything at least twice. You know, once I’ve realized I forgot to change colors. Or cast on for the arms. Or cast off for the neck. Or that I’ve decreased instead of increased. Oh, sweet baby J, the list goes on longer than I am willing to admit! Keep in mind… A baby sweater. That means it’s like, what? 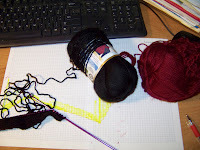 Twenty square inches of knitting? That’s less knitting than a scarf. I’ve put off getting the glasses because, you know, it’s going to be time for bifocals. Poor old Patwoman, can’t read the road signs while driving, and now she has to knit by feel. Anyway, I’ve missed the deadline to have this sweater done by the baby shower, so it’s just going to be a “welcome baby” gift now. 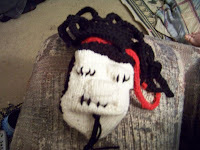 I’ve pulled the cursed item off the needles and frogged back about 4 inches. Yes, that’s a large percentage of a baby sweater, I know. So How's That Baby Sweater Going, Patwoman? Oh, I'm so glad you asked. First, let me say that it seems to take longer to knit a baby sweater than it used to. Maybe that's because I'm a little out of practice? Or maybe because I've been Sick (You notice I capitalized sick? That's how sick I've been.) and haven't been able to sit down stay sitting down for extended periods of time. And what is it with these stupid stomach viruses, any way? (Virusi? You'd think 4 years of Latin would kick in there.) Didn't I just have this same stupid stomach thing two weeks ago? It's cost me two sick days from work! I did not want to use my sick days on being sick! And do you think I like projectile vomiting? Without the supermodel benefit? WTF? 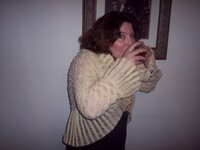 Anyway, I used to knit these kinds of sweaters all the time for R and M when they were babies. You knit them all in one piece, up the back and down the front. Then you seam the sides and sleeves. (I should dig one of those out and post a pic.) Not the most form-fitting of sweaters, but you know, they were babies and were okay with it. So my niece has a baby shower on the 28th, which I won't be attending, because that's M's birthday and it would be an all day trip to drive there. But I wanted to send her something nice. So I decided to do a custom baby sweater. Now, I know her hubby is a Trekkie. So, what could be better than a Baby Star Fleet Sweater? It's a red uniform, which, I know, is usually reserved for the crewmen with no name. But it is also the color of command. I will, of course, be adding the captain's insignia's to the collar. The rough part was charting the thing. Maybe because I'm sick and unfocused, who knows? But, once I started, it went quickly. 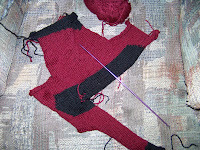 I will most likely finish the knitting today. No, I'm not trying to be cryptic. This scientist guy says space smells like melted metal, fried steak, and "welding a motorbike." I love the way people do that—describe something in the most bizarre way possible. I don’t know how you can say space smells like one thing or another, anyway. If there’s no air, what are you smelling? Your own breath? The inside of your helmet? Oh, who knows? I guess he could say space smells like whatever he wants. There are very few people who could call him on it anyway. I’m finding it kinda interesting, all the low-cost cooking/frugal living websites that are springing up. Even the corporate biggies like Kraft are adding “Budget Menus” to their newsletters. Sign of the times, I guess. But I am totally addicted to them. I spend all kinds of time, cruising these sites for recipes (and some of them are very good), tips, and how-tos. Some of the articles are useful, some not. I’m probably never going to bake all my own bread, even if I only have to get up early one day a week to put the dough that’s been proofing overnight into the oven. I’m probably not ever going to switch to reconstituted dry milk, either. But I am planning on a larger vegetable/herb garden this year than in previous years. I think that’s just practical, though. Every time you turn around, you read some story about tainted food. I just feel like I have to take control over some of this. You know I always grow a lot of tomatoes (my method of combating the unseen Tomato Consortium, which causes tomatoes to cost $3.99/lb in season!) and a lot of peppers. This year, I am thinking of growing some other veggies, too, leaf lettuce, green onions, pole beans. I’d like to attempt strawberries again, too, but those have not been successful crops for me in the past. Also, I’ve been fascinated by all the recycling projects. Sure, I love the market bags and the reclaimed sweater projects. But I love all those take-something-old-and-crappy-and-make-it-new-and-cool crafts, too. I love the light bulb bud vases like you see here, but I have switched to the "green" bulbs, so those don’t lend themselves to that. 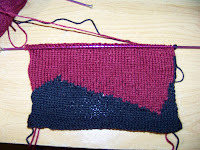 I have also been seeing all these great stash-busting scarves on Craftster, which are pretty cool. Not that I need or want to bust my stash. I do, in fact, have a scrap afghan going right now, so it’s not like I’m overrun with bits of yarn. But, like I said, I’m fascinated by these crafts. 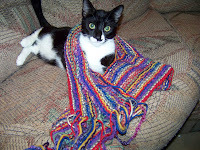 So, here is my Rainbowlicious Scarf, modeled by Achilles, who is not normally this calm, but has completely worn himself out chasing all the other cats. It’s your basic lengthwise garter knit. I used #9’s and cast on about 120 stitches. I left about 7 inches at the beginning and end and just knotted them as I went, creating the fringe. Check this out. It’s Tsantsa. 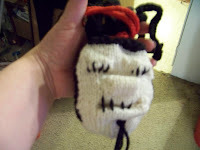 I thought it made a cool dice bag for R's birthday (today). Of course, it’s not nearly big enough to hold all his dice, but it will hold a regular d20 set and some others pretty easily. It’s really interesting the way the face just kind of appears in the bag. You make it by using short rows and a couple of 2-stitch twists. That was pretty cool. What’s not so much fun is that the pattern just assumes you know stuff, like finish knitting the row, if it doesn’t tell you what to do. Or like, pick up the wraps from the wrap and turns that you do. It’s all acrylic, so it can be easily washed. I went down a couple of needle sizes, too, to make a tighter fabric. I used #4s. Didn’t take long to knit, either. 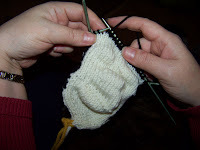 I think it actually might have gone quicker if I were a little more experienced with toe-up socks (because you start out with just a couple of stitches on dpns and then increase out).